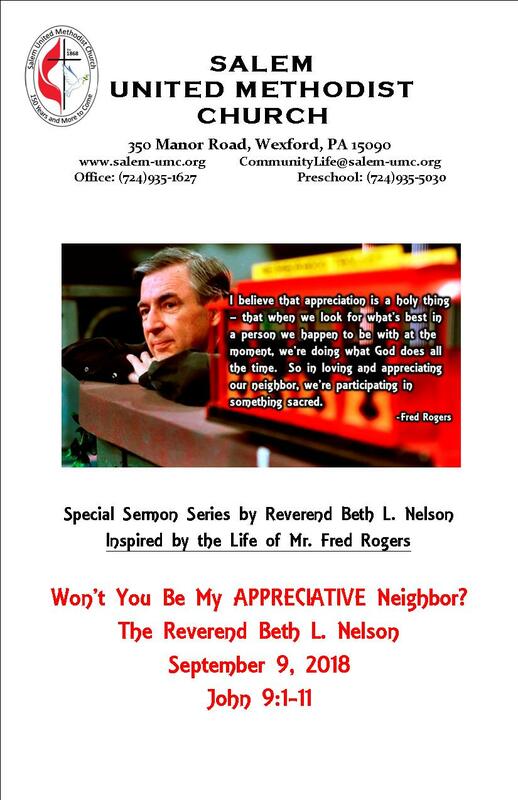 Salem United Methodist Church - September 9, 2018: Won’t You Be My Appreciative Neighbor? Home/Words from Pastor Beth L. Nelson/September 9, 2018: Won’t You Be My Appreciative Neighbor? community. His blindness made it impossible for him to develop into his full potential. It always made him seem different than everyone else, less important than others. The world around him attributed his blindness to sin. They saw his disability as some sort of punishment from God. And because of all those issues, he was an outcast in society, forced to live a life as the poorest of the poor, and his only option for survival was begging. This was his life, day in and day out, sitting along dirt roads, and relying on whatever spare change people would throw his way. Jesus sees this dirty outcast blind man, begging on the side of the dirt road…and the first words out of his mouth are, “This man was born blind so that God’s mighty works would be displayed through him.” Jesus values this man for exactly who he is. And Jesus may be the first person to do so! He values this man, and he sees that God’s glory is being shown through him. And Jesus tells him and others who may have heard. In an intimate expression of love, Jesus does not ask the man to change and he doesn’t ask the man to come and meet him. Jesus goes to him. He meets him in the same dirt and mud where he has been sitting for years. Jesus digs his hands into the muck and mire of this man’s life, and with this same mud, he cures him. Jesus enables him to see for the first time in his life. He is literally brought out of the darkness into the full light of daily life. importance of caring for other living creatures. One day, Mr. Rogers received a letter from a 5-year-old girl named Katie. She was blind, and she was writing Mister Rogers because she was worried about his fish. Since she couldn’t see him with his fish, she was concerned that he wasn’t feeding them. But he would feed them without saying out loud that he was feeding them. Her father added a note on Katie’s letter that this really worried her, and she would often cry about not hearing about the fish being fed. He listened to Katie, and because he loved and respected her he took steps to heal what was hurting her. But that involved getting down to her level and changing the way he’d done things. Mr. Rogers met her in the muck and complications of her 5 years of life. He met her as she is created to be in order to see ways that he could change, and through this act of love, he was able to change and bring about her healing. poverty. Jesus saw him and loved him for who he was. Mr. Rogers teaches us that too in the way he accepts this little boy, just the way he is. In the Kingdom of God, we are met where we are, and we are understood for who we are, and we are loved. So hear this Good News: God loves you exactly as who you are. All the traits and flaws that society has told you that you have, God loves you with them. All of our physical attributes that the media tells us that do not measure up…God loves the you God made you to be. We know this because of Jesus. Because we have seen him show love time and time again. By joining people in their dirt, by seeing their pain, and through kind words and intimate interaction, he heals them with love. So what do we do with this acceptance, this love? How can we be the neighbor who acts like Jesus? How can we see as Jesus sees? Can we see the blind man and help restore him to wholeness? When we love and accept others, we are doing what God does. God created humanity in God’s own image, in the divine image God created them, male and female God created them, God created us! Sometimes, however, we seem to forget this about the driver who cut us off on the way to church this morning, the one whom we really disagree with about politics, the one whose theology is so stagnate, the neighbor across the street or on the other side of the world with a different culture or religion, and the person whose experience I simply do not understand. Each one of them is created in the divine image. Each one of us, also created in God’s own image. It is a choice to believe that and we daily make choices. I have a challenge for you. Every morning….As you are getting up…think of 3 people that you are thankful for. 3 people in your life that you appreciate. Name them out loud! Thank God for them. Then throughout the day…look for 3 more people to appreciate. Maybe it is the check-out person at Giant Eagle. Maybe it is the person who delivers your mail. Maybe it is the person whose memory filled your heart in some random moment. Seek 3 people during the day, and thank God for each of them. And as you go to sleep at night, think back…and thank God for 3 people who made your life a little better these past 15 hours. In making a point to do that every day, I am certain that we might just change the way we appreciate people. When I moved into the parsonage at Mars Church, an older man came to my door and he delivered a cherry pie from his mother. He told me it was her tradition to make a pie to welcome every pastor and she had made many pies in her 92 years. I thanked him, and over the next few days I had a couple pieces of that pie. It was OK crust and canned cherry pie filling. The following week, I stopped by her house to return her pie pan and say thank you. When I met Hazel, the beautiful older woman, greatly crippled with arthritis, barely able to shuffle to the door…That pie, canned filling and all…suddenly seemed like the best pie in the world. What a gift! What an effort! Meeting her, spending time with her, that pie was the best welcome gift ever. I appreciated her and her gift so much more. Oh, the difference when you know the neighbor! Jesus continually showed us what this looks like. Where others saw a shady tax collector, Jesus saw Zacchaeus. Where neighbors defined a woman by her rather questionable reputation, Jesus saw a spiritually thirsty person. When a man met Jesus and who was possessed by many demons, Jesus noticed the individual that was worthy of wholeness. Jesus loves us. He sees beyond our flaws and those parts of ourselves that we don’t like very much. Friends, whatever dirt you are sitting in, whatever issues seem to bring that feeling of being overwhelmed, whatever pain you know and are trying to stuff into your back pockets, I know that God will join you there. I see that in this story of Jesus and I have experienced it in my life. All of God’s love and compassion, is there for us, always! Today, you and I can choose to appreciate the people in our lives. When we see beyond the labels to the very presence of God in which each of us are created, we’re doing what God does. And when we truly see ourselves as the special people God created us to be, it is easier to appreciate God’s image in others. My friends…. God says those words too!